If you've made the effort to install designer tiles and give your bathroom some extra elegance, then you probably want designer bathroom fittings to complete the look. This can be anything from the big things - the bath itself, along with the WC unit and the sink basin - down to the relatively small things like designer tap fittings and shower mixers. At Real Stone & Tile we are able to offer a selection of designer bathroom fittings at amazing prices, often around half the manufacturer's suggested selling price and sometimes discounted by even more than that. Some of these are ex-display from our Cheshire bathrooms showroom, and you can bet that if we used them to show our designer tiles at their best in our showroom, they will look equally impressive in your bathroom. But if you don't want to buy ex-display, we also regularly have new supplies of brand new bathroom fittings at substantial discounts too. To see what's in stock, what its recommended selling price is, and how much we're offering as a discount, just check our special offers page at any time. If you see something you like, make sure to place your order quickly, as many of these products are strictly limited stock and we might not be able to get more once they are gone. 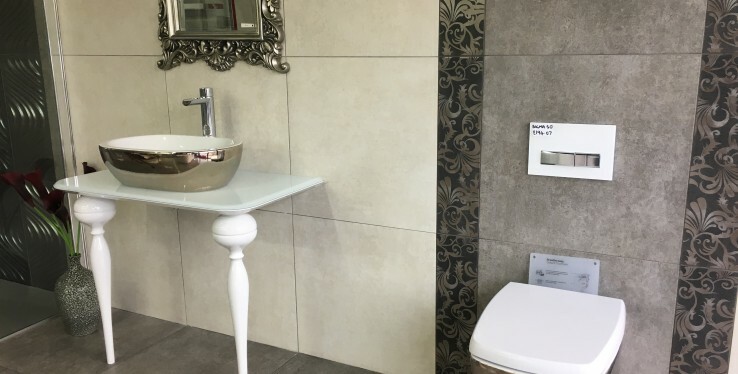 As well as special offers on bathroom fittings, we have a full range of fixtures, fittings and furniture available to view and buy from our Cheshire bathrooms showroom. There may be less of a discount on our standard stock, but we still work hard to offer you great value on high-quality fittings that will really do justice to your designer tiles as part of an overall interior design scheme. For more information about any of these, call or email us, or come and visit us in person at our Cheshire showroom to see our current stock.